Recently, certain Trinitarian apologists have quoted Yale University's Dr. Bentley Layton in an attempt to deny that a correct translation of Coptic John 1:1c is "the Word was a god." But they show that they are not really listening to what he said. They use words from Dr. Layton in conjunction with his Coptic grammar book, ie., "The indef. 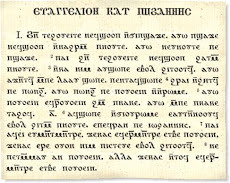 article is part of the Coptic syntactic pattern. This pattern predicates either a quality (we'd omit the English article in English: "is divine") or an entity ("is a god"); the reader decides which reading to give it. The Coptic pattern does NOT predicate equivalence with the proper name "God"; in Coptic, God is always without exception supplied with the def. article. Occurrence of an anarthrous noun in this pattern would be odd." Second, Dr. Layton says that "God is always without exception supplied with the definite article." But at John 1:1c, "God" does not have the definite article. Therefore, John 1:1c does not say "the Word was God." Trinitarian apologists who quote Dr. Layton should note that his words here do not support the popular translation, "the Word was God." Although Dr. Layton says "The reader decides which reading to give it," this should be on the basis of the type of Coptic noun the indefinite article qualifies. Certain types of Coptic indefinite nouns do not need to have the indefinite article translated by "a," but the Coptic noun noute, "god" is not one of those nouns. With noute and nouns of its class, the "a" is translated, as shown by Coptic grammarian Thomas O. Lambdin's example in his grammar book, where he translates ntof ounoute pe as "he is a god." -- Thomas O. Lambdin's Introduction to Sahidic Coptic, page 18. Some Trinitarian apologists also quote George Horner's translation "[a] God was the Word," wherein Horner puts brackets around the "a" as if the "a" is not really needed. But Horner was very inconsistent in translating the Coptic "a" into English. He put brackets around it at John 1:1c, but there are numerous examples in his translation where the exact same Coptic construction exists and he does not put the "a" in brackets. Perhaps theology, not grammar, lies behind Reverend Horner's use of brackets at John 1:1c in his English translation. The "a" belongs there, and without brackets, and Horner himself routinely uses the "a" in the indefinite construction! Coptic researcher J. Warren Wells of the excellent, well-documented Sahidica Project is sometimes mentioned by the Trinitarian apologists as a knowledgeable person who is not sure if John 1:1c should be translated as "the Word was a god." So I asked Wells personally. Mr. Wells has 30 years in Greek studies and 20 years of Coptic study, and Wells has confirmed positively that the Coptic version of John 1:1c literally does say, "a god was the Word." Trinitarian apologists will continue to chafe at the inconvenience for their theory that the Coptic translation provides. Here is an ancient Bible translation (2nd-3rd centuries) that confirms the very reading of the New World Translation, which the Trinitarian apologists have attacked for over 50 years. But they can't accuse the Coptic version of being translated by "Freddy Franz" or by scholars with no knowledge of Greek. Greek was a part of Coptic civilization for 500 years. So, they try to find "experts" who will blunt the impact of the Coptic reading. But the evidence for "the Word was a god" or similar -- "the Word was a divine being," "the Word was like God," etc. -- in the Coptic version is solid. Thanks for this fine information! Many translations of the Greek, including the excellent New World Translation have rendered this verse with 'a god' or 'divine'. Such translations have been criticized by proponants of Holy Trinity doctrine. The fact is though that such translations do accurately represent the Greek as the Coptic translation testifies. This is so, because the Coptic translators grew up with Greek as an important international language, they knew Koine Greek better than anyone today can claim to. It is hard to imagine that such translators got it wrong. So modern translators that have rendered with "a god" or "divine" are in the very best of company. Thanks for the information. How accurate/reliable is Coptic in comparison to Latin and Syriac? Why has most of the focus been on Latin and Syriac and only Coptic recently? Are Latin and Syriac considered better renderings, more reliable, more authentic? The Sahidic Coptic version (2nd/3rd century) is for the most part a very literal, reliable, and authentic translation of the Koine Greek text into the Egyptian language, the last stage of which is called Coptic. Perhaps focus has been on Latin and Syriac because Bible scholars have had more familiarity with those languages, and those were the ones taught at universities. The Coptic languages have been primarily in the care of the Coptic Orthodox Church, which for long has been a church existing under political or religious persecution. Perhaps the current popularity of Coptic is due, not so much to the Coptic New Testament, but to the apocryphal gospels of Thomas, Philip, and Judas. These Gnostic Gospels have overshadowed the more important translation of the Canonical Gospels into Coptic. Where the Greek (lack of the)indefinite is ambiguous and open to debate, the Coptic is straightforward and leaves no doubt as to meaning. Second, the Coptic Christians were obviously Greek scholars and their plain translation confirms the modern translations of some whose worldly credentials have come under question. The truth is open to anyone who wants to see it. You have struck a blow for such truth. Bruce, your comments are appreciated. I wrote that post a year ago, and since then, Coptic scholar Dr. Bentley Layton has published his excellent grammar book, "Coptic in 20 Lessons," which puts the grammatical points in clear focus and confirms the main points of my post. Yes, this is vindication of the fine work of certain translators who gave the Greek text of John 1:1 an honest rendering, a rendering which the ancient Coptic versions agree with. Does anyone else find it ironic that the NWT critics say John 1:1 is inaccurate because it's indefinite and not qualitative, but then they turn around and say that the Sahidic is qualitative in meaning, despite it actually being indefinite? Yes, that's one of the many ironies presented by Trinitarian apologists. The doctrine itself is so out of sync with the Scriptures that verbal gymnastica and contortions have been a part of its exegesis from the beginning.